Synteko Nova Best is a two-component, water-based, low-odour, non-yellowing polyurethane hardwood timber floor finish for use in high traffic commercial areas. Synteko Nova Best which is NMP-free is an environmentally friendly timber floor finish with extremely low VOC’s, yet is very hard and user friendly. In addition it has an extended open coat time to facilitate application. This finish is highly desirable because it emphasises the timber’s natural colour. 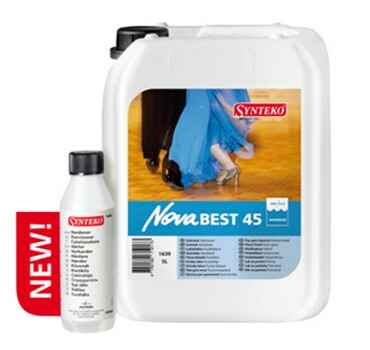 Synteko Nova Best is resistant to wear, scratching, scuffing, marring and chemicals. It is, therefore, ideal for surfaces subjected to unusually heavy wear, provided adequate coatings are applied and sufficient curing has taken place. Synteko Nova Best can be used on un-treated, previously finished or pre-finished timber surfaces. Synteko Nova Best replaces Synteko Best and supersedes Star.